Jim Amidon — I was thinking a lot about Wabash College history over the weekend. When President Pat White welcomed about 400 high school seniors and their families in the Chapel on Friday, the 118th Honor Scholarship Weekend was underway. While we can’t prove it definitively, we believe that Wabash boasts the nation’s oldest merit-based scholarship competition. Since the 1890s, the College has invested in the promise of smart, motivated young men and their potential to change the world. After welcoming the Honor Scholars, 24 hours later the President threw out the first pitch at the new Wabash Ballpark — home of the Wabash baseball team. With that ceremonial pitch, a new chapter was written in Wabash athletics history — a history that dates to 1866 when Wabash won the very first game of intercollegiate baseball played in Indiana. Wabash is a place steeped in tradition. The College grew its sports identity just three decades after its founding in 1832 with that first baseball game against Asbury College. Before the turn of that century, Wabash would win the first intercollegiate football (1884) and basketball (1896) games played in our state. Part of what makes Wabash appealing to young men is its history — and the College’s love of its history. When high school men come to campus for visit weekends like Honor Scholarship Weekend, they listen intently when their tour guides explain that Forest Hall was constructed in 1833 and that Center Hall is over 150 years old. Those same high school guys seem to delight when they hear Center Hall’s wooden stairs creak beneath their feet and as they glide their hands over the well-worn handrails. There is pride in the fact that Wabash won all those early sports championships and the College’s players and coaches were pioneers of the games we love today. I think parents, too, rejoice in Wabash’s history of producing local, state, and national leaders in education, law, medicine, and business. There’s something reassuring in Wabash’s history — its track record — as a liberal arts college that has never wavered from its mission. When a college has granted academic scholarships for 118 years, you know that it’s serious in its commitment to the young men who enroll at Wabash. Parents realize this. But there’s an interesting paradox, too. Those same high school students who love the creaky steps and worn wood of Center Hall might not consider Wabash if its science labs weren’t state-of-the-art and its athletic facilities top-notch. The history and traditions “feel” good and help young men and their families see themselves as a part of a bigger whole. The new Wabash Ballpark, the Field Turf in the football stadium, and the incredible biochemistry labs demonstrate the College’s commitment to the best possible educational experience for its students. It’s a great combination — tradition-rich and cutting-edge. Wabash boasts one of the strongest alumni networks of any college in the country. Our teaching faculty is second to none. The two centers — the Center of Inquiry and the Wabash Center — are leading international conversations on teaching and learning and the liberal arts. President White has issued a challenge of excellence to everyone affiliated with Wabash — which both honors our past and celebrates our future. The Honor Scholarships earned by the men of the Class of 2015 and the new outdoor athletics facilities are indeed forward-looking. But they are both rooted in a proud and rich history. Steve Charles—Students in Professor Eric Freeze’s Travel Writing class were still introducing themselves to MacGregor Visiting Writer Patrick Madden on Monday afternoon when the author suddenly stood up. A slight unease buzzed among the students. Was this guy nuts? Then with perfect timing, Madden fixed his gaze on Sphinx Club pledge Ryan Lutz ’13, who was wearing the trademark ragged pot and odd garb of the Club’s initiates. The writer’s face broke into a mischievous grin. “So aren’t you supposed to do something?” Madden asked Lutz over the chuckles of his classmates. “We have rules,” Lutz said, and he was right—pledge activities can’t disturb the classroom. “I’m disappointed,” Madden said, playfully shrugging his shoulders and sitting down next to the pledge. And thus began an hour and a half writer’s workshop session concentrating on three of the students’ essays. There’s teaching by word and teaching by example. 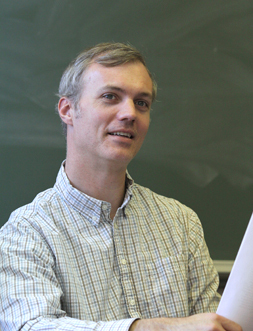 A professor at Brigham Young University and author of the recently published book of essays Quotidiana, Madden proved skillful at helping students find the words to improve their own work during the two workshop sessions he led. But that “air raid” request was an unforgettable example for writing students of the way a writer comes at the world—not only paying attention to his new surroundings, but engaging an audience with his discoveries. That’s Madden’s stock in trade as a teacher and master of the associative essay, a craft he sums up as “connecting little snippets of observation.” At a noontime public reading in Lovell Lecture Hall on Tuesday, Madden’s host and fellow BYU and Ohio University grad Freeze noted that the author’s subjects range from music (as in Led Zepellin, Rush, Beatles) to Montevideo, Uruguay to laughter to doppelgangers to garlic. 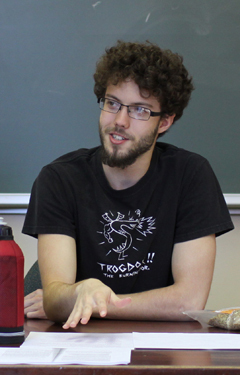 The essayist majored in physics as an undergraduate and his writing carries a scientist’s meticulous observation skills infused with wild curiosity and love of language as a tool for exploration. Currently those topics include: What is originality? What is time? And Madden read to his Wabash audience a recently completed essay on momentum that blends physics and metaphysics with an injury to his daughter, the memory of brother-in-law’s burns and “a mother’s momentous guilt”—a piece in which objective observation leads to the deeply personal and moving, even faith. “Wabash always fights,” several responded. Madden’s travel writing has focused primarily on his wife’s home country of Uruguay. It’s too early to know if Madden’s words and workshop will inspire and improve the writing of Eric Freeze’s travel writing students. Two of their essays have real possibilities for publication. But will those students find the patience, humility, and self-discipline to revise in these lengthening days of early spring. If they don’t, it won’t be because they haven’t seen how the work is done. From his air raid request to his reflections on the nature of momentum, Madden has opened their eyes to a much wider range of possibilities, as well as a writer’s responsibility to think, learn, and write without restraint. In photos: (top left) Patrick Madden in Professor Freeze’s Travel Writing class; (above right) Liam Smith talk with Madden about his own writing. 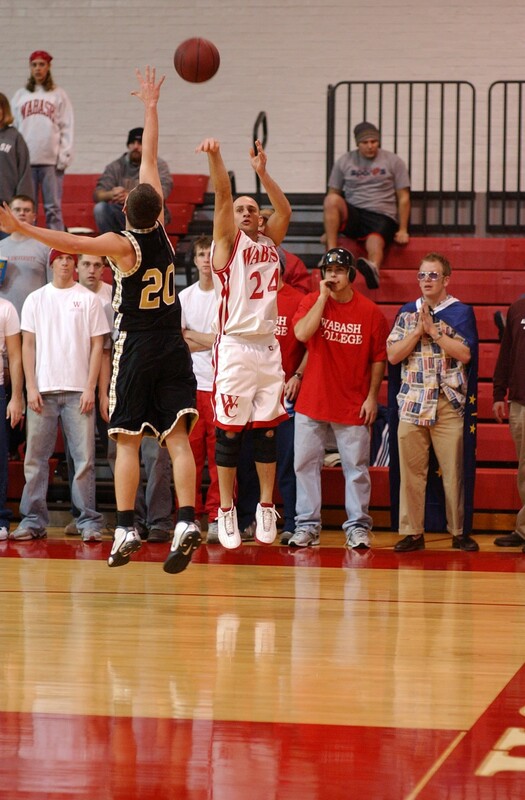 If you had a chance to watch Matt Storm ’04 play basketball at Wabash, you know the drive and determination he showed on every single trip up the court. Now he’s transferred that can-do attitude to coaching. Storm led his North Miami High School boy’s basketball team to a 48-41 victory in the Class 2A Sectional 39 championship against Manchester High School. Storm played in 65 games at Wabash as one of the top 3-point shooters in Little Giant history. He connected on 107 3-point shots in his career, ranking him seventh all time. He also ranks in the top-20 on the Wabash career list in 3-point field goal percentage, free throw percentage, steals, and assists. He was an Honorable Mention All-North Coast Athletic Conference selection as a senior, averaging 11.1 points and 1.33 steals per game as a senior. 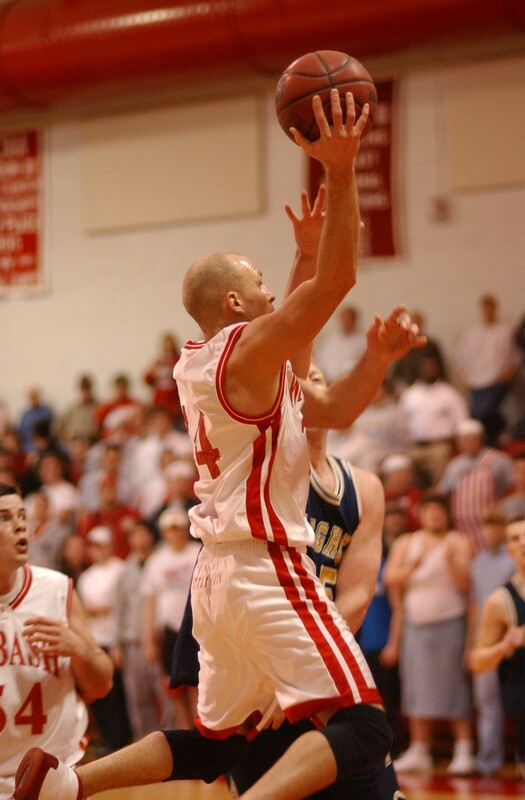 After graduating, Storm spent two years as an assistant coach at Manchester College before turning to the high school ranks as an assistant coach at Plainfield. This is his first season as the head boy’s basketball coach at North Miami. His team finished the regular season with a 5-15 mark, but won three games in the sectional to claim the title. Storm’s team will face Carroll (Flora) in the regional at Tipton High School on Saturday. The Journal Review ran a feature story on Storm and his coaching success. You can read the article here.